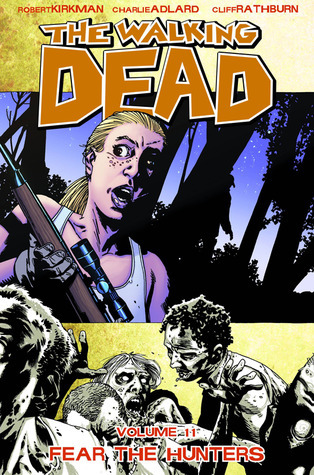 The eleventh volume of The Walking Dead includes issues 61-66 and leads the gang to more danger. They're still moving, camping out where they can, but when Father Gabriel approaches them, they take shelter in his church. However, there's someone stalking them in the shadows. And I'm not talking about the zombies. Sure, the dead creatures are still a threat--always a threat--but it's once again humans who want a piece of them. I'm only going to say one word: cannibals. Yuck! It's a good thing Rick, Abraham, Michonne and Andrea are strong enough to do whatever it takes to eliminate a threat. We still lose another one, though. Something really disturbing happens in this volume. Something that Carl takes care of. Wow. Just wow. This series is totally insane, and I love it!